The Scientific Evidence for God Is Already Here, So What Are You Doing About It? The concept of a higher power, popularly called God, is millennia old. The idea is that there are phenomena in our manifest experience that cannot be explained on the basis of material, worldly causes alone; their explanation requires the causal intervention from God. This divine intervention is called downward causation. This conjures up the picture of God as a mighty emperor sitting in a throne in heaven and doling out acts of downward causation—creation acts, miracle healing for devotees, judgement for the virtuous and sinners, and so forth. Yet support for this naïve, outdated picture is implicit in pop religions even today, Christianity is no exception. Scientists take advantage of the naivete of God supporters pooh-poohing the notion above as philosophically untenable dualism. God dishing out downward causation is impossible because how does a nonmaterial God interact with matter? Two entities that have nothing in common cannot interact. The question is, does the upward causation model really explain us, our consciousness? The proponents of the Godless universe also posit that consciousness is an illusory ornamental epiphenomenon (secondary phenomenon) of the complex material box that we call the brain—as the liver secretes bile, so does the brain secrete consciousness. But this position obviously begs the question. Is Consciousness a Hard Question? Currently, some philosophers have begun to call consciousness “the hard question.” Of course, such a designation depends on the context one chooses. The context for thinking of consciousness as a hard question is neurophysiology, brain science whose motto is “the brain is behind all of our subjective experiences.” This reminds me of a Zen story. If you think of consciousness as an epiphenomenon of the brain, consciousness is a hard question indeed; you are making it hard. Consider. An objective model always seeks an answer to the question in terms of objects. Thus neurophysiologists seek to understand consciousness in terms of other objects, brain, neurons, etc. The underlying assumption is that consciousness is an object. But consciousness is also a subject, that which does the looking at object(s). The subjective aspect of consciousness exposes one weakness of the neurophysiological model. The truth is consciousness to us is not only a hard question but also an impossible question for materialists. This is because even pop religions, simplistic as their view of downward causation may be, have always been clear about one thing, that we have free will, that without our free will to choose God, God’s power of downward causation would be in vain. If we are choosing God, we are choosing what is good; we are choosing values and ethics. But we need free will for that. So the proponents of upward causation come down hard on the concept of free will. Like consciousness, our free will is also an illusory epiphenomenon of the brain, they insist. In this insistence that we are behaviorally determined machines, walking zombies, materialist science is undermining values and ethics, the very foundations of our societies and cultures. So is there God and downward causation, is consciousness real, and do we have free will? Is the wisdom of the upward causation model final or is there new scientific evidence to suggest otherwise? There is. There was a revolution in physics at the beginning of the last century, consisting of the discovery of quantum physics. The message of quantum physics is this: Yes, Virginia, there is God and it is the only being there is. You can call it consciousness if you like and think of it as the ground of all being. In quantum language, the neurophysiologists’ upward causation model translates like this: Possible movements of elementary particles make up possible movements of atoms, make up possible movements of molecules, make up possible movements of cells, make up possible brain states, make up consciousness. Consciousness itself then is a conglomerate of possibilities, called a wave of possibility. How can a wave of possibility collapse another wave of possibility by looking or interacting with it? If you couple possibility with possibility, all you get is a bigger possibility, not actuality. Suppose you imagine a possible influx of money in your bank account. Couple that with all the possible cars that you can imagine. Will this exercise ever actualize a car in your garage? Face it. For the neurophysiological epiphenomenal model of consciousness, how our looking can change possibility into actuality is a logical paradox. It stays a paradox until you recognize first, that quantum possibilities are possibilities of consciousness itself, which is the ground of all being. And second, that our looking is tantamount to choosing from among the quantum possibilities the one unique facet that becomes our experienced actuality. It was in the nineteen seventies that the physicist Fred Alan Wolf created the evocative phrase “we create our own reality.” The images the phrase evoked led, however, to many disappointments. Some people tried to manifest personal automobiles, others vegetable gardens in desert environments, and still others a simple parking space for their cars in busy downtown areas. Everybody was inspired by the theory of quantum creation, no doubt, but the results of their efforts were a mixed bag because they were unaware of some subtleties. We create our own reality, but there is a subtlety in consciousness. We do not create reality in our ordinary state of consciousness but in a non-ordinary state of consciousness. This becomes clear when you ponder the paradox of Wigner’s friend. Eugene Wigner was the Nobel laureate physicist who first thought of the paradox. After many decades, three physicists at different places and times (Ludwig Bass in Australia, myself at Oregon, and Casey Blood at Rutgers, New Jersey) independently discovered the solution of the paradox: Consciousness is one, nonlocal and cosmic, behind the two people’s local individuality. They both choose but from this non-ordinary state of one consciousness (which I call the quantum self) where there is no local individuality or selfishness so contradiction can be avoided. This allows the common sense result that in many such crossings, Wigner and his friend each would get green fifty percent of the time; yet for any individual crossing, a creative opportunity for getting green is left open for each. A key point is that quantum downward causation of choice is discontinuously exerted (if it were continuous, a mathematical model could be constructed for it, and the choice would be predictable and not free), but our ordinary state of consciousness smoothes out the discontinuity. To be aware that we choose is to wake up to the non-ordinary oneness taking a discontinuous leap, call it a quantum leap. In this way, the dictum of the new physics: I choose, therefore I am (my cosmic quantum self). If you are having difficulty picturing a discontinuous quantum leap, an idea of Niels Bohr can help. Electrons go around the atomic nucleus in continuous orbits. But when an electron jumps from one orbit to another, it makes the jump in a very discontinuous way; it never goes through the intermediate space between the orbits. This jump is a quantum leap. How does the cosmic, nonlocal quantum self become individualized? How does continuity obscure the discontinuity? It does so via conditioning. Before conditioning, consciousness chooses its response to a stimulus from the quantum possibilities with total freedom (subject only to the constraint of the quantum dynamics of the situation). With experience and learning, the responses get prejudiced in favor of past responses, which psychologists call conditioning. Identifying with the conditioned pattern of responses (habits of character) and the history of the memories of past responses gives us an apparent local individuality, the ego. When we operate from the ego, our own patterns of conditioning, our experience acquires an apparent causal continuity. The good news is that experiments are already showing that consciousness is nonlocal; it is unitive. The first such experiment proving it unequivocally (that is, with objective machines and not through subjective experiences of people) was performed by the neurophysiologist Jacobo Grinberg and his collaborators at the University of Mexico. Quantum physics, besides discontinuity, gives us another amazing principle to operate with—non-locality. The principle of locality says that all communication must proceed through local signals that have a speed limit. Einstein established this speed limit as the speed of light (the enormous but finite speed of 300,000 km/s). So this locality principle, a limitation imposed by Einsteinian thinking precludes instantaneous communication via signals. And yet, quantum objects are able to influence one another instantly, once they interact and become correlated through quantum nonlocality. The Physicist Alain Aspect and his collaborators demonstrated this in 1982. The data does not have to be seen as a contradiction to Einsteinian thinking once we recognize quantum nonlocality for what it is—a signal-less interconnectedness outside space and time. Grinberg, in 1993, was trying to demonstrate quantum nonlocality for two correlated brains. Two people meditate together with the intention of direct (signal less, nonlocal) communication. After twenty minutes, they are separated (while still continuing their unifying intention), placed in individual Faraday cages (electromagnetically impervious chambers), and each brain is wired up to an electroencephalogram (EEG) machine. One subject is shown a series of light flashes producing in his or her brain an electrical activity that is recorded in the EEG machine from which an “evoked potential” is extracted with the help of a computer upon subtracting the noise. The evoked potential is somehow found to be transferred to the other subject’s brain onto the EEG of this subject which now gives (upon subtraction of noise) a transferred potential (similar to the evoked potential in phase and strength). Control subjects (those who do not meditate together or are unable to hold the intention for signal-less communication during the duration of the experiment) do not show any transferred potential. The experiment demonstrates the nonlocality of brain responses to be sure, but something even more important—nonlocality of consciousness. How else to explain how the forced choice of the evoked response in one brain can lead to the choice of an (almost) identical response in the correlated partner’s brain? The neuropsychiatrist Peter Fenwick in London has replicated the experiment since then. Here then are the crucial points: We experience a quantum object, that is, its quantum possibilities transform to an actual event of our experience only when we choose a particular facet of the possibilities. And when we choose, we are one with everything, we are one with the ground of being; we are in God-consciousness. Our exercise of choice, an event quantum physicists call the “collapse” of the quantum possibility wave, is God’s exercise of the power of downward causation. 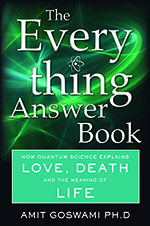 In this way, the first and foremost scientific evidence for the existence of God is the vast evidence for the validity of quantum physics (which hardly anybody doubts) and the validity of our particular interpretation of quantum physics (for which there are some doubters). Fortunately, there are two scientific ways to resolve these doubts: First, by demonstrating that the interpretation presented here resolves logical paradoxes rather than raises them (the opposite is true for the upward causation model); and secondly, by making predictions that can be experimentally verified. The scientific evidence for the existence of God is already here because the new science-within-consciousness based on the interpretation of quantum physics that I am sharing with you is passing both these tests of scientific validity as demonstrated above. 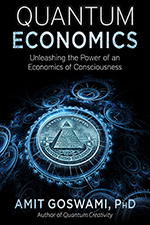 In the preceding pages, I gave you a taste of how the new ideas resolve the paradox of the upward causation neurophysiological model of consciousness. I also gave you a taste of an experimental verification of a prediction of the model, the nonlocality of consciousness. The new science tells us that the universe, God, and us are not really separate. The separateness of God, the world, and us is an appearance, is the real illusion. The real questions are why does the world appear to be separate from us? And what does the fact that we get lost in this separateness from the universe and from each other do to us and to the human condition? Is there any way to go beyond this separation dynamic? In the new science, we find that the world is here because of us, and we are here because of the world. The separation dynamic is one of mutual creation, our pretend for play. When we creatively comprehend this, the separation dynamic loses its hold on us. The story of the universe is our story. When we understand us, our consciousness, we also understand the universe, and the separation disappears. What happens to the play when the separateness goes? Are you curious to find out? Are you tired of the old play that has given us the nightmares of terrorism, energy crises, global warming, and the possibility of nuclear war? Are you ready to opt for a new play? Are you ready to explore the potentials of a consciousness-based worldview—the potentials of your waking up to subtler levels of consciousness? Then you are ready to appreciate the importance of the scientific rediscovery of God. The materialist view has dominated science for the past four hundred years, and it has given us technology and the answers to a great many problems until finally it seems to have run out of gas. Much of its present-day inquiries sound more like the medieval query—“How many angels can dance on a pin?” This old tired science cannot give us answers to today’s big problems: how do we deal with terrorism? What do we do about energy when we run out of fossil fuels? Now that global warming is fact, what can we do about it? How do we guarantee that nuclear warfare does not break out among nations? How do we teach values to our children when our science professes to be value free and our governments profess secularism? How do we transform capitalistic economics so that the gap between the rich and the poor becomes narrower instead of wider? How do we defend democracy against the power of money and the media? How do we curb the skyrocketing cost of health and healing in the developed countries? Like the question of consciousness, these are hard, nay impossible, questions for the materialist worldview. But materialists won’t admit it. The answers are right around the corner; they try to assure us, an assertion that the philosopher Karl Popper called promissory materialism. And of course, there are those age-old human questions, subjective questions, which materialist science leaves out from its agenda: What is the meaning of my life? How can I love? How do I become happy? What is the future of my evolution? These are also impossible questions for the materialist. But the new science-within-consciousness has already made a good beginning in finding answers for these questions. A key to developing a science that can embrace the solution space for the questions above is to realize that what we experience as matter is but one important component of the many quantum possibilities of consciousness, the component that we experience through our senses. The psychologist Carl Jung intuited that there are three more components of conscious possibilities that we experience as feeling, meaning, and intuition respectively. Recent work of Rupert Sheldrake, of Roger Penrose, and of mine, has established that feeling, meaning, and intuition cannot be reduced to material movement; they really do belong to independent compartments of consciousness. These compartments are variously recognized as the vital energy body, the mental body, and the supra mental theme (archetype in Plato’s language) body of consciousness. All these compartments are non-locally connected through consciousness. The reason that the material compartment dominates our science is that the material makes quasi-permanent representations of the vital and the mental (and eventually will develop the capacity of even making representations of the supra mental—this is the direction of our future evolution). Once the representations (software) are made in the hardware, we forget the representation maker (consciousness) and the process (of using the blueprints–mind and the vital body). Read my book The Visionary Window, and The Quantum Doctor for further elaboration of these concepts. Basically, what are emerging are two kinds of scientific evidence for God. One kind consists of recognizing the many mansions in which God’s downward causation takes abode beyond the material mansion (as for example, feeling, thinking, and intuiting). Phenomena in these nonmaterial domains are all impossible problems for the materialist upward causation model. The second kind of evidence I call the quantum signatures of the divine. Phenomena resulting from downward causation in our model come with specific quantum signatures that upward causation cannot generate. When caused by the latter, macroscopic phenomena are continuous, local, and hierarchically linear and one-way (such as in a patriarchy). The quantum signatures of downward causation are discontinuity (as in the creative aha experience), nonlocality (as in mental telepathy), and circular hierarchy, also called tangled hierarchy (as in love). Space does not permit me to go into details that can be found in my books mentioned above. So What Are You Doing About All This? 1. How do you think of the world right now? Is matter its building block? Is consciousness? 2. If you already permit the possibility that it could be consciousness, then ask yourself, do you feel separate from the whole? If you do feel separate, why? 3. If you know why, or at least have some inkling about it, then ask, what can you do about this separateness? 2. Explore the potentials of consciousness. 3. Understand how you became separate from the whole. 4. Practice and realize the power of intentions. 5. Resolve conflicts and integrate partial (and conflicting) wisdoms into a whole. 6. Prepare to wake up to the nonlocality of consciousness. 7. Work on your own transformation but include the perspective of the evolution of consciousness (movement of the whole). 8. Move from the world of impossible problems—materialist science —to the world of possible solutions (science-within-consciousness).